Author Emilia DeliziaPosted on 11 October, 2013 10 October, 2018 Tags balsamic vinegar, food experience in italy, Italy food factories visits, parma ham factory, Parmesan cheese tourLeave a comment on What Food Factories can I visit in Italy? The Parmesan cheese tour – Parma: Parmigiano Reggiano Factory departing from Bologna, Modena, Reggio Emilia. 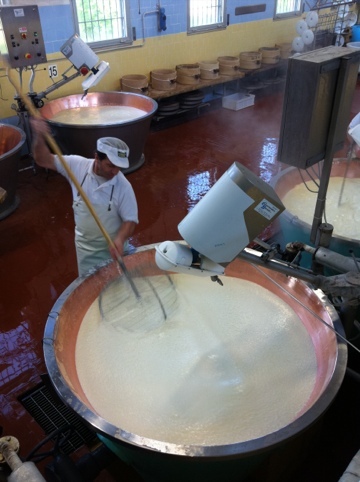 How to see the Parmesan production at a dairy in Italy. 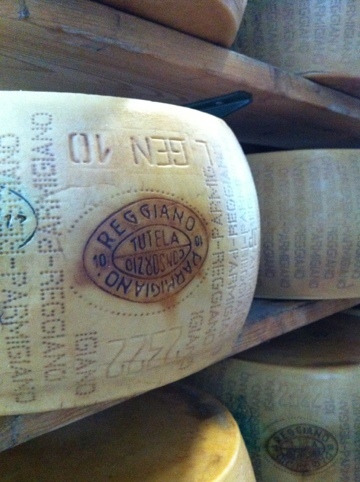 Parmesan cheese is produced only once a day and you will find it only in a small area in northern Italy. In fact it is mainly produced in Modena, Parma and Reggio Emilila however there are some producers in the Bologna and Mantua provinces. To see the production it is recommended to arrive at the dairy between 8.15 am and 9.30 in case there is a possibility to see larger producers where the cheese making process ends later. The visit lasts about 1 hour and 30 minutes. Guests will be able to see with their eyes the whole process, from raw milk, the making of the curds, the brine process and the ageing cellars. There are about 300 dairies in the DOP production areas and Emilia Delizia has selected some of the best places to see the cheese making. We visit family owned businesses or organic cooperatives where the Parmean or Parmigiano Reggiano as we call it in Italy. The milks come from cows owned by the producers in the area, and this milk must reach the dairy within 2 hours as it is specified by the consortium. Parmesan cheese is then aged for a minimum of 12 months before receiving an inspection and only then if it is approved it become a DOP product and it can be sold as Parmigiano Reggiano. Emilia Delizia can organise a tour of the facility that produce the cheese, normally we can pick up the client from their hotel from Bologna at 7.15 am, or from Modena and Parma at 8.15 am. We can organise a car with driver to pick you up and an English speaking guide, however if you have your own car we can set you an itinerary that you can follow and save money on the chauffeur fees. One of the pleasures of travelling through Italy most definitely lays in its food, especially when enjoyed in unique and picturesque settings. Emilia Romagna has a lot to offer in the way of traditional cuisine, most local dishes have made it worldwide and their success now graces the dining tables of all food enthusiasts around the world. When enjoying local cuisine with simple or complex dishes – be it at a restaurant, a trattoria or in other such places that celebrate foodies’ needs with great food from the tradition of Emilia Romagna cooking – keep in mind that some of the ingredients you’re tasting are locally sourced and belong to the very history and culture of the Italian region. This is the case for the fames Balsamic Vinegar of Modena, for several kinds of ham and cold cuts made in the area, and is also true for Parmesan cheese. While it is also employed in several dishes throughout Italy and abroad, and is enjoyed as a topping for pasta and other foods everywhere in the world, Parmesan is notably known in Emilia Romagna as a traditional cheese that can be tasted on its own. As it’s true for many different kinds of dairy products that can be found on a cheese platter, Parmesan can (and should – at least once in one’s life) be eaten as a standalone experience, but not many tourists think about doing this during their trip to Italy. Foodies are more likely to know about this, but everyone should experience Parmesan in its pure form, and going to visit a dairy where the cheese is produced is the perfect way to sample the goods and marvel at the production process and cutting method employed for this Emilia Romagna treasure. Here are some dairies in the province of Modena that you can visit for tastings, guided tours of the facility, and to shop Parmesan, local products and souvenirs. This dairy is located just outside Modena and as such can be easily reached if you’re already visiting the city proper. Founded in 1949, this dairy has perfected the production of Parmigiano cheese and the raw materials are all locally sourced, to achieve Parmesan aged for up to 36 months where the milk employed hasn’t suffered any losses in quality through the supply chain. The dairy, opened every day from 8:30 to 12:30 and from 15:30 to 19:30 (open only from 8:30 to 9:30 on Sundays for a brief stop to shop for Parmesan and more), offers a variety of guided tours and tastings for locals and tourists (also in English and with audio guides available). Tourists will be able to choose from breakfast tours, a daily tour (with a visit of the Parmesan dairy factory, a vinegar place and lunch at a local restaurant) or other events such as a workshop weekend where visitors will take part to the production of the cheese and learn more about local culture. Please see antica latteria ducale for info. Located near the city of Zocca, in the province of Modena, this dairy factory can be visited throughout the week (it’s closed on Mondays and on Friday afternoons, opening hours are 9:00-12:30 and 16:00-19:00). Since the location varies from other dairies closer to the city of Modena, in here you’ll be able to find products related to the mountain territory. Here you’ll be able to sample and purchase a type of Parmesan made from the milk of a white- coated breed of cow from the territory of Modena. The dairy is located near the city of Sassuolo and you can book guided tours of the entire production line of Parmesan, or experience the single phases of the process such as the preparation of the milk and the cheese, the storing area and learn about the aging process. In the dairy’s shop you’ll be able to sample and purchase Parmigiano cheese. Please see their site. Through booking, it’s possible to take part to guided tours every day, and they will last 1-1 and a half hours. depending on the type of tasting experience you choose, which will include sampling Parmesan with different aging periods, local cold cuts, balsamic vinegar, wines and more. You’ll have a chance to explore the history and production process of the cheese through the dairy, and you’ll witness the incredible storage for the Parmesan cheese wheels. More info here. This dairy is located further from Modena, but still retains those aspects of the city’s culture and tradition, with a different spin. Near the towns of Maserno and Montese, the Caseificio Belvedere offers the usual tours and tastings of Parmesan along with other peculiar culinary experiences of the Apennines. In the dairy’s shop, you’ll find local produce, Parmesan cheese and more. Author gabriele montiPosted on 6 May, 2012 30 July, 2018 Tags Bologna food tours, italian cheese farm tour, Parma cheese tour, Parmesan cheese tour, parmesan factory tour, parmigiano reggiano tour, parmigiano tours, visit parmesan factory10 Comments on The Parmesan cheese tour – Parma: Parmigiano Reggiano Factory departing from Bologna, Modena, Reggio Emilia.